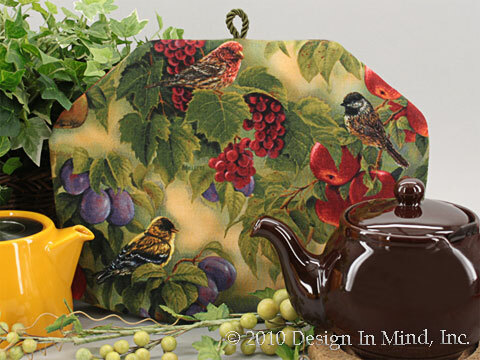 Tea cozies that celebrate the harvest on fabric. 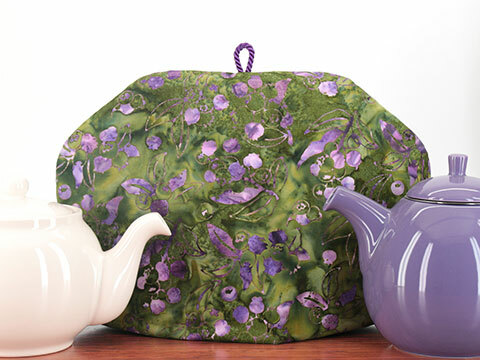 Tea cozies that celebrate the harvest on fabric. These cozies are made to order and will be shipped typically within 1 week after your order is received. See the "Quick Ship!" group for tea cosies available to ship now. 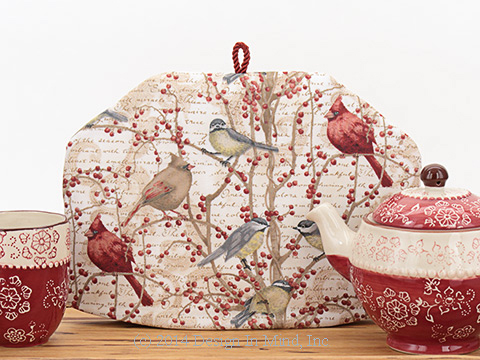 Cardinals and black-capped chickadees flock to a well stocked dining spot, with a background of text and scrolls, on this elegantly natural tea cozy. Quilters cotton fabric in shades of cream, taupe, burgundy, grey and soft yellow. Shown with Napa pottery. 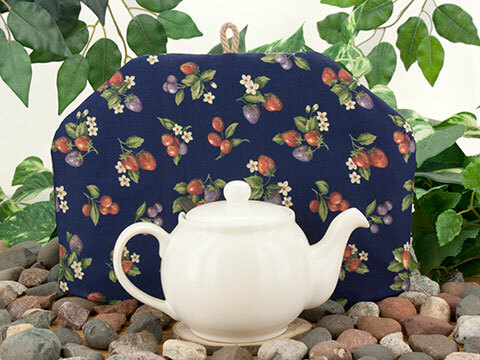 Red and purple berries and creamy flowers cover the navy background of this delicious tea cozy. 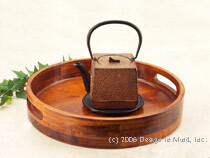 Topped with a natural twine loop. 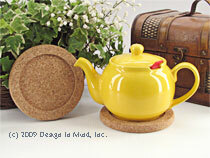 Shown with the Chatsford teapot in cream. Quilters cotton fabric. Colorful birds sitting each in their favorite fruit tree. 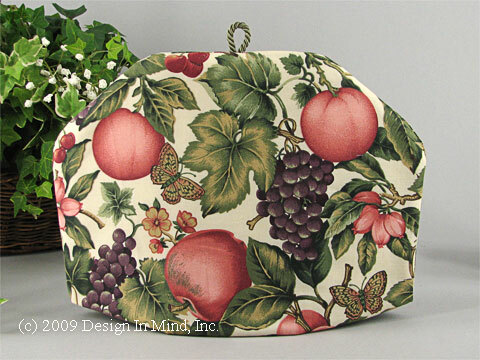 Red and green apples, red berries, and plump plum trees with variegated green leaves on a soft melon colored background. This bird lover's tea cozy is ready for any season in your home. Quilters cotton fabric. 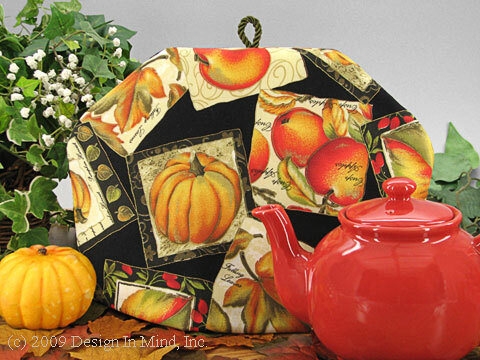 A tea cozy with falling leaves, a pumpkin harvest and crisp apples in fall colors showing us Autumn is here! Quilters cotton fabric. 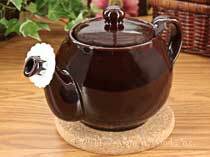 Shown here with the red orange 6 cup Sadler Style teapot. 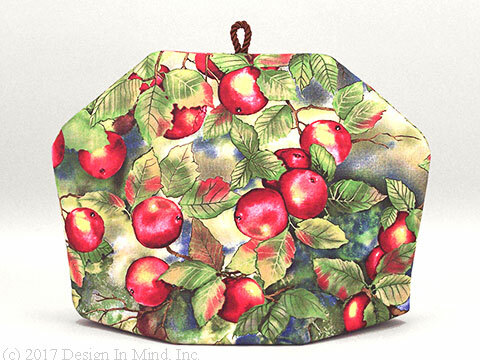 Fruit and berries abound on this tea cozy in muted shades of burgundy, purple, light brick, tan and green on a cream colored quilters cotton. The leaves seem to shimmer on this moonlit grapevine at harvest time. 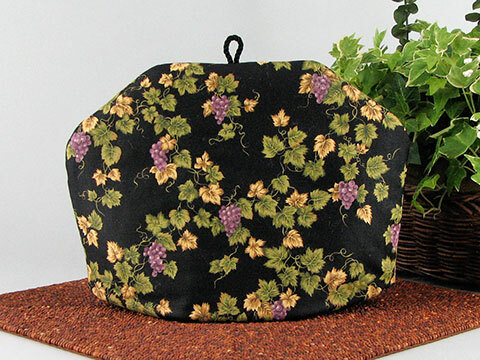 Tea cozy cover fabric is black quilters cotton. 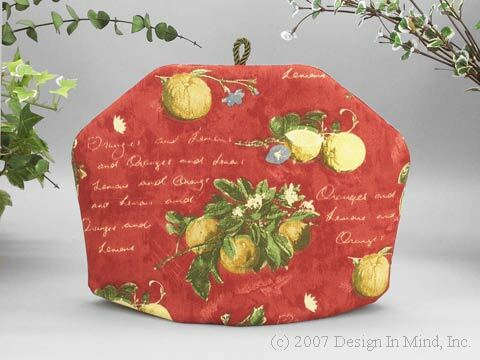 Orange and lemon fruits with shades of green leafy branches and a hint of cornflower blue flowers on a brick colored watercolor background. Coarse weave cotton. A wonderful watercolor print of sitting under the apple tree on a sunny day and looking through the branches to a cloud puffed blue sky. Quilter's cotton. 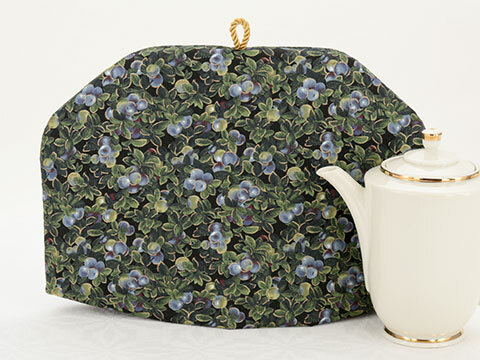 This tea cozy cover looks like a luscious field of ripe blueberries. Colors are a black quilter's cotton background laden with blueberries and laced with gold. 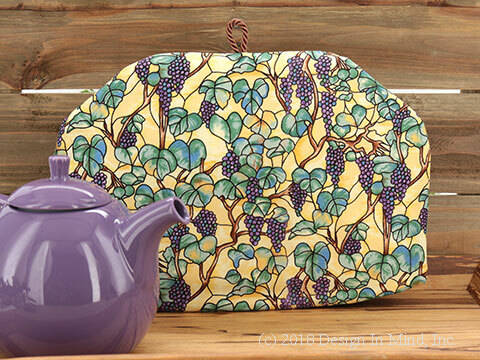 This tea cozy reminds us of a stylish Tiffany's lamp, this time in a grapes and vine motiff. The cover is a fine quilter's cotton and the colors are a beautiful lemon yellow with purple hues in the grapes and a rich vine trunk in browns.